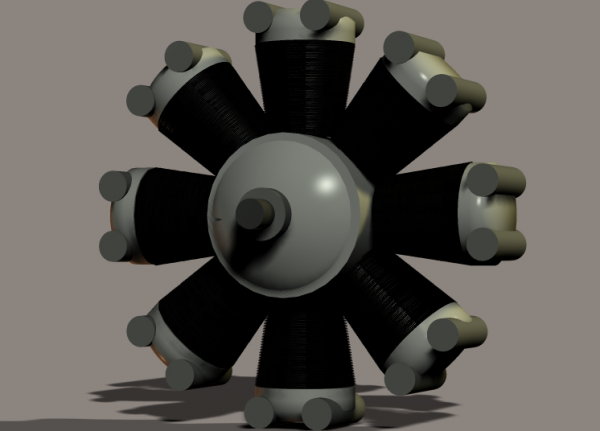 The radial aircraft engine is a simple prop featuring realistic cylinder fins...which makes it a little bigger file than usual. One engine can be used as is, or stack one behind anohter to make a 16-cylinder radial and so on. Give your aircraft models a realistic-looking power plant. A spare cylinder is included for making other air-cooled engine types, such as V-twin (motorcycle! ), flat 4 and 6, etc. AIFrank (1 year ago) Inappropriate? Petercat (2 years ago) Inappropriate? Radial engines have an odd number of cylinders, I.E., 3,5,7 and so on. Yours has eight.